Please note: As Associate Editor, I am soliciting reviews of recent dissertations in the Anthropology of Food. So if you have written a recent thesis or would like to review one, you can contact me directly: Katharina Graf (kg38@soas.ac.uk). Anna He Purnabramha: Deorukhe Women’s Agency in the Making of Bodies, Cuisine, and Culture in Maharashtra, India. Gauri Anilkumar Pitale. Ph.D. Thesis in Anthropology, Southern Illinois University, Carbondale. 2017. Gauri A. Pitale’s doctoral work takes a biocultural approach to understanding potential health implications of dietary changes in the context of liberalization, globalization, and national change in India. Pitale worked with 66 pairs of Deorukhe Brahmin mothers and daughters living in rural and urban Maharashtra; mothers were all born and raised in a pre-liberalization India, with daughters born and raised in the post-liberalization era. Drawing on qualitative and anthropometric data, Pitale looks at intergenerational differences, asking how changing dietary practices are implicated in notions of the self and identity. In doing so, she considers Chronic Non-Communicable Diseases (CNCDs), including obesity, hypertension and diabetes, testing a range of hypotheses, and exploring foodscapes in terms of the lived experiences of her participants and issues of purity, perceptions of health, and the body. What particularly stands out in her ethnographic approach is the placing of anthropometric measurements within larger contexts of notions of identity and caste purity. Her anthropometric results and discussions are bracketed by chapters that draw on her qualitative data and her fieldwork reflections, including considerations of changing perceptions of food/cooking and implications for relationships and exchange, and the ways that processes of urbanization can affect food habits and preferences. There is much to think about in Pitale’s work, including reflections on the expected and unexpected in fieldwork, urbanization and the presence of CNCDs, and changes in food habits that have both dietary and moral implications for participants. Pitale’s dissertation allows readers to reflect on questions that are of importance both in contemporary India and that also address broader issues of identity, belonging, food, and place. These include: How do notions of purity and kinship intersect with cooking rules, not just in terms of food eaten, but also with regards to how the space of a traditional hearth is used, and what it symbolizes? How does convenience get complicated by notions of authenticity and taste? What do kitchen implements and home-grown or home-prepared spices mean in terms of family history and tradition? How do space and place affect the types of food that daughters want to cook, and their relative cooking skills? How are community ties reinforced through shared cooking activities? And, How are anxieties around maintaining caste identities and/or engaging with cosmopolitan identities, intersecting with food? These questions are considered through different cultural and data lenses. For example, Pitale provides a discussion of cooking and kitchens, including the symbolic, sacred value of the traditional chul (a u-shaped clay stove, coated with a double-layer of plaster made from cow dung and water, and red earth) and its associated rules for use, versus the comparatively rule-free and convenient gas stove. Through her discussion, Pitale demonstrates some of everyday complexities of balancing multiple factors in food preparation and consumption. Another example includes considerations of some of the differences when it comes to cooking skills among rural and urban daughters. While young rural women are expected to develop cooking skills and learn how to manage a kitchen at a young age, in part related to the need for an alternative cook when mothers are practicing menstrual seclusion, urban daughters are less likely to have significant skills in the kitchen. When urban daughters do cook, it is more likely non-traditional recipes, or “fun” foods like pizza and cakes. This also connects to the chul, with urban daughters preferring to use gas stoves, and in some cases, being unable to effectively cook on a chul at all. With her anthropometric data, Pitale also considers how nutritional transitions are implicated in CNCDs; she hypothesises clear differences between her rural and urban participants, with a generational effect. Her findings indicate that, for example, based on weight circumference, almost all mothers (rural and urban) would be considered obese (86.4%), but rural daughters were more likely to be underweight than urban daughters. One of Pitale’s surprising findings was in terms of blood pressure; contrary to expectations, rural mothers had higher blood pressure than urban mothers. This finding questions underlying assumptions that traditional diets and activity levels can help to minimise high blood pressure, while urbanized diets and lifestyles can increase it. Overall, this is a rich dissertation that uses a range of data collection methods to create a complicated picture of the ways that food intersects with notions of the self, and health. Who should read this dissertation? This work is of interest to anyone who is thinking about how food practices shape and are shaped by everyday rural or urban life, and the implications that this has for how people think about their identities and health, and to those looking for an example of the complexities of economic liberalization, rural-urban differences, and caste in contemporary India. The thesis will also be of interest to researchers thinking about how to approach biocultural research projects, and how to integrate anthropometric and qualitative data within ethnography. As I read the dissertation, a number of questions emerged for me around some of the public elements of Pitale’s work, her findings, and her fieldwork experiences, and my review concludes with an interview addressing some of these questions. Elizabeth Finnis (EF): Hi, Gauri! I enjoyed reading your doctoral work, and thank you for letting the SAFN blog host this review and an interview with you about your work and research experiences. My first question is something that I often ask people during (or immediately after!) a defense: Who would you hope would read your work, outside of anthropological audiences? Gauri A. Pitale (GAP): I would love for everyone to read my dissertation because I certainly find it rather riveting a topic! Jokes apart, I think my study would be illuminating for those governmental agencies that are working on addressing problems related to the double-burden of overnutrition and undernutrition that India is facing. As a country, we [Indians] are leading in the numbers of deaths that are connected to CNCDs. The increasing encroachment of multi-national corporations that sell fast foods and ones that may result in the disappearance of small kirana (grocery) shops is concerning. India is in a precarious position. The coming two to three decades will vitally change the food consumption and the food distribution system of the entire country. Yes, certainly we should address the biological causes that make Indians susceptible to CNCDs. But if the government does not increase awareness among people, there is high likelihood that India will face the same challenges that western nations like the United States of America faced starting the 1970s and 1980s. On the one hand, we notice that an increasing number of urban Indians are becoming more and more conscious of how to maintain their health by going to dieticians and/or the gym. On the other hand, large swathes of Indians are turning to Ayurveda and traditional remedies to counter these same problems. It is my hope that this dissertation highlights how variable the answers can be within one country. Other than government agencies, I would also love for my research to be read by the Deorukhe community. I hope they find it useful. I have already given them a copy of my dissertation and am currently waiting to hear back from them. EF: So, then what do you hope a non-anthropologist will really understand about your research? GAP: When I explained my dissertation research focus to my Indian friends and family, their responses were rather interesting. Some found the research topic to be rather bland, while others thought that the information I was gathering was so commonplace that they couldn’t comprehend why it needed to be researched at all. Non-Indian friends and family also found the subject pale in comparison to studying the more “exotic” aspects of Indian culture and society. I soon realized that people take food for granted. While Indians have a medicinal system entrenched in food, westerners are usually more focused on the nutritional aspects of food. That said, food and eating has been and will always remain a social as well as an emotional experience. Though the relationship between food consumption and health seems like a straightforward one, my study demonstrates that making any sort of policy decisions to control or even address the rising appearance of Chronic Non-Communicable Disorders (CNCDs) will remain hopelessly abstruse if we disregard the historical, ecological, political, as well as the economic aspects of why people eat the way they do. Certainly, there are a multitude of factors involved but a deep understanding of the issue on both a local and global level is valid and necessary. To actually affect change, we need to start making lay people aware of this simple fact: food and the body are not things that can be studied bereft of their social surroundings. EF: Your answer makes me think a bit about how the participants in your research thought about blood pressure and mental/emotional stress. You argue that for your participants, particularly the rural ones, high blood pressure is considered related to mental and emotional stress, and is therefore seen as a temporary condition. Are there bigger implications of this understanding of high blood pressure? GAP: This is one of the aspects of my study that surprised me immensely. I hypothesized that high blood pressure would be more common among urban participants in comparison to rural participants. This is in line with published research doing a comparative analysis between urban and rural populations. Therefore, the results of my data collection coupled with my experiences in the field were atypical and confusing. My rural interlocutors did view high blood pressure to be the result of a temporary condition. These people were also going to rural medical practitioners. I wish I had the time to visit these doctors to ascertain whether they had actually told the interlocutors that this was a temporary condition. The main thing that concerned me was, if hypertension was being viewed as a temporary health issue occurring as a result of stress, then treating it accordingly might result in more health complications in the long run. More importantly, the implications of this perspective are two-fold. One, if and when a complication does occur in the future when these women are older, the problem would be treated as something to be expected because high blood pressure is seen as a chronic health condition that plagues old people. Two, most studies expect hypertension to be a condition that is commonly noted among urban people; rural people suffering from the same condition might not even be considered to be at risk. This could mean that they will never be tested or treated until a complication arises. A large part of rural India bears the burden of undernutrition. The Deorukhes are comparatively well-off thanks to their caste status. Therefore, we must also acknowledge this occurrence of hypertension among this rural population might not be something that applies to people of all castes in rural India. For all of these reasons, it is highly likely that these conditions will not be noticed anytime soon. This concerns and worries me, especially in connection to their long-term health and their quality of life. EF: I found it interesting to read your brief discussion of the guilt felt by some mothers if they don’t – or can’t – cook for their children. Do you think similar feelings can play out in different kinds of households, both within and outside of India? What makes it different (or not) for your participants? GAP: What a fantastic question! I am happy you asked me this. The guilt felt by mothers is certainly not unique to Indian culture. There are many cultures in which I assume women experience guilt that corresponds with the diet and health of their family members. I assume because having grown up in India, I experience this guilt and deal with it on a day-to-day basis. I believe the difference lies in how my participants experience this within the social dynamics of Indian society. I am certain women in other cultures also have certain expectations that are thrust upon them. In the case of my interlocutors however, there is the added layer of caste-related food prescriptions. The expectation that Deorukhe Brahmin women in general have to safeguard household purity is a larger part of this guilt. Women have to learn to prepare traditional foods so that they can pass on traditions to daughters and daughters-in-law. And while every culture has a family recipe that can be learned from elders in the family, how integral these recipes are to one’s communal identity changes from one culture to another. I can give you an example of something that occurred in my own family. I happened to visit the family of a friend who was of a lower caste. They invited me for dinner one evening. I remember that her mom had made some type of shellfish that I had never tried before. I found it to be rather delicious. Upon returning home my grandmother promptly asked me what had been served for dinner. I told her about this unheard-of shellfish and asked my mother why she never cooked this fish at home. My grandmother immediately replied, “We don’t buy that kind of fish. Those are eaten by lower caste people.” Until that moment, I had no idea that my friend belonged to a different caste group at all. But my grandmother deemed it necessary to educate me about the differences in upper and lower caste fish consumption at the age of 10, lest I make any such demands again. These conversations are ubiquitous in rural and urban Indian households. The guilt felt at crossing these boundaries is an additional aspect of the guilt felt by my interlocutors. It may not be unique to India because I am sure this kind of gate-keeping also occurs in other world cultures. The difference may be in the amount of social consequences that result from women’s failure to control the food that enters their households in general and into the bodies of their family members in particular. EF: I also appreciated the methodological and positionality reflections that you incorporate into your dissertation. For example, you write about how, when collecting data, you were positioned as the ‘expert’, but that when you entered kitchens, you became understood as lacking in experience and basic knowledge. What did this kind of ‘flip’ in perceptions of expertise teach you about doing ethnographic research? GAP: The first lesson that I learned when I went into the field was that people tell you what they think you want to hear. This is a lesson we all learn as anthropologists, and that’s why we spend so much time getting comfortable with our interlocutors and participating in their lives as we observe them. My fieldwork was incredibly fruitful. Despite that, my appearance as an Indian woman who lived in America and had come back to India to study the Deorukhes put me in an interesting position. In one part of the introduction chapter of my dissertation, I discuss my position and the social capital that I had which resulted in the Deorukhes allowing me into their homes. However, my familiarity, while at times a disadvantage, was also an advantage in this case. I want to be clear that I’m not implying that non-native anthropologists may not have used this strategy to make their interlocutors comfortable. But the fact remains that the conversations about food and food habits that I had with Deorukhe mothers lacked the depth that I found satisfying. I also realized that talking in their living rooms about food often resulted in the whole family, and in some case entire neighborhoods, monitoring the interaction. The resultant conversation was stunted and awkward, something I noticed as I started transcribing my field recordings. I was spending more time asking questions and directing conversations rather than getting answers. The request to enter their kitchens to watch them cook was put forth for two main reasons. One, not everyone is allowed entry into each other’s household kitchens. The audience had to leave or wait outside in the living room, allowing me and the woman to be alone or at least have fewer people around. This was something I noticed in one household during my first visit. I went into the kitchen to return a cup of coffee to the lady of the house. She told me where to place the dirty cup in the kitchen and promptly started amending some of her answers. Her husband and some men in the village were sitting outside in the living room hearing us talk. In the kitchen, she started complaining about how difficult it is to manage the food habits of her husband. It became obvious that the kitchen was her domain and the one place she felt safe to voice her opinions without being overheard, especially by the men since they rarely ventured into this space. The second reason was to reduce the awkwardness of sitting and talking without having anything to do. Most of my interlocutors were happy to show off their kitchens to me. No matter how small or large, how fancy or simple, these were their spaces, arranged to their liking, and spaces that they controlled. Also, if they kept busy, I assumed our discussions would be more fruitful. The dynamic shift was an unexpected discovery. As soon as I noticed it, I immediately began to ponder on the manner in which their assumption of my inexperience in matters related to running a household relaxed them and made them want to impart knowledge to me. Present day anthropology has come a long way from what we thought about our interlocutors to how we perceive them today. They are the experts from whom we learn. I went into the field with that point of view. And while I fully intended to carry out semi-structured interviews, I also had a long list of questions prepared so that I could collect data on food acquisition patterns. I still have this data. I have piles of data about how much rice, flour, lentils, masalas, etc. each household buys. I also have data about the money each household spends on food and other food acquisition pattern information. While I meticulously collected this data in the field, I also realized that for me, the deep ethnographic data that started to shine and capture my attention was what I encountered in the kitchens as I watched women cook. These discussions and interactions were far more rewarding and indicative of what they wanted to tell me. I chose to focus on their voices rather than only focus on my initial study objectives. What this taught me is that it is important to go into the field with specific objectives. However, it is equally important to allow our interlocutors to tell us what they deem to be important for us to know. In between these two points is where the actual fun and research lies! EF: In focusing on the health of women, did you ever get participants wondering why you weren’t also considering the health of men? If yes, in what kinds of ways did you respond to these queries? Restricting the study to women and girls was something that I had already discussed with my advisors and committee members. This is because ease of access to my interlocutors and the ability to hold conversations in both public and private was important to me. There is a high amount of gender segregation in India. As a woman, it was easier for me to get access to and speak with young girls and women. Conversations with men were not impossible but these took place more in urban settings rather than rural settings. As for your question about whether participants wondered about why my research did not consider men, they did not. That is because I told them when I was recruiting that I was focusing on women because they were the gastronomic gate-keepers and the ones in charge of managing the household’s food consumption patterns. This made sense to my interlocutors. From their perspective, I was not only measuring their and their daughters’ bodies, but at the same time I was discussing with them the health of their entire family. My interlocutors often told me how they managed to ensure their sons, husbands, or fathers-in-law stayed healthy. This was vital to their discussions about the various challenges that they face when trying to keep their families healthy, a responsibility not to be taken lightly. EF: Your picture of changing food habits among your participant households is both rich, and, as you indicate yourself, patchy in some ways. What’s next for you, in terms of research? GAP: This is a wonderful question! I loved every minute of my fieldwork and found interacting with the Deorukhe community in general to be a very rewarding experience. As a doctoral candidate who went into the field for her first long-term fieldwork, I experienced a lot of anxiety when things did not go as planned. The lack of both time and money was on the forefront of my mind. This meant that as much as possible, I collected every piece of information that I could. Along the way, I also collected large swathes of data about factors that I had not even considered to be influential to my research results. This is a large reason for why my research results are rich and at the same time provide a patchy picture. I think that is the strength of ethnographic fieldwork. I struggled to make sense of the enormous amount of information that I gathered during my fieldwork after I returned to America. After much contemplation and several discussions with my advisors and doctoral committee members, it became clear that the only way I could write this dissertation, for me, was by focusing on things that my interlocutors spoke about the most. Those are the things I have written about. I am happy with the way my dissertation has turned out, but it honestly only speaks about 30% of the information that I have gathered during my fieldwork. Going forward I will publish chapters of my dissertation. Someday soon, I would also like to return to the field with funding so that I can fill in the gaps that currently exist, while also noting the changes that have taken place since 2014. And while I want to continue working with the Deorukhe community, I would also like to add another caste group, preferably people who are meat-eaters. This might allow for a richer and better comparative analysis. In an India that is experiencing large-scale dietary changes, I would like to see how the idea of purity and caste identities continues to play out. That would enable us, as food anthropologists, to really study the communal tension that underlies the study of food and culture in modern day India. EF: Thank you, Gauri, for your responses, and for your contributions to the SAFN blog! With the title, “Latinx Foodways in North America,” we aim to put the series in a more international perspective, inclusive of the United States, Caribbean, Mexico, Central America, and Canada. Here we introduce Dr. Meghan Farley Webb’s informative piece on fieldwork methods and nutrition with indigenous communities in rural Guatemala. Her work illustrates the global framework of this series. Enjoy! Wuqu’ Kawoq | Maya Health Alliance is an NGO providing high-quality, evidence-based health care in indigenous communities in Guatemala. Guatemala is especially affected by chronic malnutrition, or stunting, with some Maya communities experiencing stunting rates of seventy-five percent.1 As part of our Complete Child program, we have undertaken several mixed-methods studies to explore why stunting remains a problem in Maya communities.2-3 Food insecurity, common in rural indigenous communities, contributes to the persistence of stunting in Maya communities. In some communities where we work, all households experience moderate to severe food insecurity, as measured by the FANTA Food Access and Insecurity Scale. The FANTA scale provides a quick (only nine questions) and cross-culturally reliable means of assessing household food insecurity. The scale pays special attention to the issue of reliable access to healthy food. Twenty-four hour food recalls are an important tool in nutritional assessment, but they have been shown to underestimate caloric and dietary diversity in Guatemala.4 Our investigations show similar problems, in part because most rural communities have a once weekly market where diverse fruits and vegetables can be purchased. Little access to refrigeration means that nutritionally diverse foods are often not available during the week. While seven-day food frequency questionnaires report higher quantities of fruits and vegetables, children’s diets remain deficient in dairy, flesh foods, eggs, and vitamin-A rich foods. Use of these questionnaires—which query the frequency of consumption of culturally relevant food items, divided into WHO food groups—is imperfect, as it may over- or underestimate consumption of some items; however, we find they provide an accurate general assessment of dietary diversity. In contrast to the limited availability of fresh fruits and vegetables, pre-packaged junk food is readily available in tienditas (small corner stores). Focus groups and ethnographic interviews reveal that the ease of preparation of pre-packaged foods as well as children’s requests for junk foods and their relative low cost were additional drivers for the consumption of low-quality, processed foods. The proliferation of junk foods—sometimes referred to as “coca-colonization”5—means that Guatemala must simultaneously work to combat both stunting and obesity. In addition to this limited access to high-quality, nutritionally diverse foods, our research shows how endemic poverty contributes to food insecurity. We use the Quick Poverty Score to assess poverty in the communities we serve. The tool uses locally relevant “poverty indicators” to assess the likelihood that a household member is at or below $2 USD or $1USD/day. It is unsurprising that many households in rural indigenous Guatemala experience high levels of poverty. On average food expenditures are low, often so low that it would be impossible to meet caloric and micronutrient needs. Our research shows that underemployment and agricultural cycles result in high variability in income, and therefore, limit money available to spend on food. Stunting rates remain high even in agricultural communities for two reasons. First, many households do not own enough land to sustain domestic production. Second, many rural agricultural communities have shifted from milpa (corn and beans) production to production for export. In the Guatemalan highlands, broccoli, snow peas, green beans, and blackberries have replaced traditionally grown and locally eaten crops. The shift to non-traditional agricultural exports negatively impacts dietary diversity not only because of a loss of subsistence crops, but also because growing these non-traditional exports often requires taking on significant debts for seeds and other agricultural inputs. Non-traditional agricultural exports have further worsened the conditions of food insecurity as the majority of rural Maya farmers do not report economic benefits to growing these crops. This is due in large part to the practice of selling crops to middlemen, rather than directly to exporters. Our research has shown how economic and environmental factors contribute to food insecurity and chronic malnutrition in rural indigenous Guatemala. Programs aimed at improving nutritional outcomes in indigenous children must also address cultural factors. For example, focus groups and numerous clinical interactions have demonstrated the importance of secondary caregivers, especially paternal grandmothers. Multi-generational family compounds mean that mothers, at whom most nutritional programming is aimed, may not be fully in control of food purchasing and/or preparation decision making. Home-based nutritional counseling offers one way to address barriers to improving nutritional outcomes in infants and young children. Internal evaluation of our nutritional programming and a recent clinical trial demonstrate the effectiveness of such intensive, home-based nutritional counseling to improve dietary diversity, minimum acceptable diet, and height/length-for-age. More information about our research, including copies of our published work and training materials, can be found here. Meghan Farley Webb is a Staff Anthropologist with Wuqu’ Kawoq|Maya Health Alliance. 1 Black, R. E., C. G. Victora, S. P. Walker, Z. A. Bhutta, P. Christian, and M. Onis. 2013. “Maternal and child undernutrition and overweight in low-income and middle-income countries.” Lancet 382. doi: 10.1016/s0140-6736(13)60937-x. 2 Ministerio de Salud Pública y Asistencia Social, Instituto Nacional de Estadística, and Secretaría de Planificación y Programación de la Presidencia. 2015. Encuesta Nacional de Salud Materno Infantil 2014-2015: Innforme de Indicadores Básicos. Guatemala City: Ministerio de Salud Pública y Asistencia Social (MSPAS). 3 Chary, Anita, Sarah Messmer, E. Sorenson, Nicole Henretty, Shom Dasgupta, and Peter Rohloff. 2013. “The Normalization of Childhood Disease: An Ethnographic Study of Child Malnutrition in Rural Guatemala.” Human Organization 72 (2):87-97. 4 Rodriguez, M. M., H. Mendez, B. Torun, D. Schroeder, and A. D. Stein. 2002. “Validation of a semi-quantitative food-frequency questionnaire for use among adults in Guatemala.” Public Health Nutrition 5. doi: 10.1079/phn2002333. Image 1: A vendor sells fresh produce in the market. Most rural indigenous communities in Guatemala have only one market day a week. 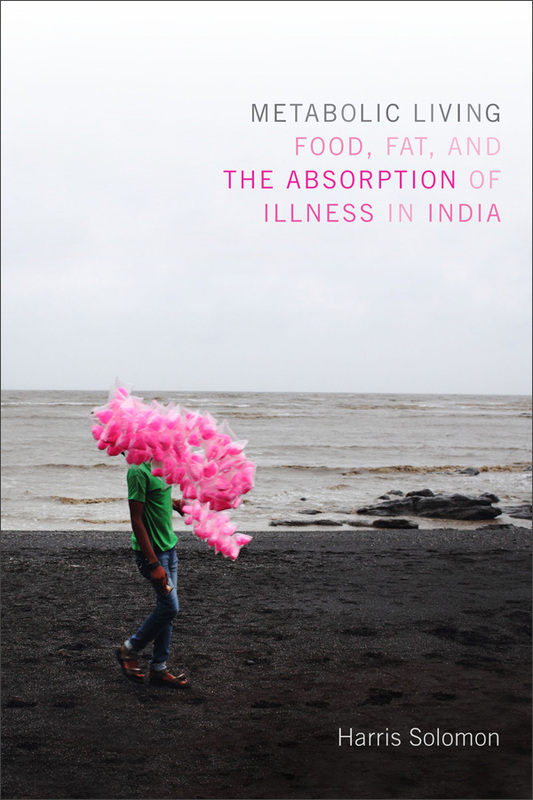 Metabolic Living: Food, Fat, and The Absorption of Illness in India. Harris Solomon. Duke University Press, 2016. This original ethnographic work studies the meanings and practices surrounding metabolic functions in the everyday life and diet of contemporary urban Indians. Set in the city of Mumbai, the author challenges the reader to question the notion of “globesity”. Such terms loom important in the epidemiological considerations about the sudden increase in obesity and type 2 diabetes in India in the past few decades. Solomon provides the readers with detailed ethnographic vignettes that render his interlocutors as real people with problems and issues connected to city living, the same problems that affect their bodies in turn. Using the concept of ‘absorption of illness’ as the central theme of the book, the author states, “I consider how people make connections between food and urban life to explain that absorption is taking hold as the ground for experiencing and making sense of chronic illness” (Pg. 5). The book begins with a discussion of the ‘thin-fat’ Indian phenotype, used by scientists to comprehend the current rates of obesity and diabetes in India. Trying to attack the concept of metabolic syndrome from many perspectives, the author generates an ethnography that takes into consideration the problem of obesity and diabetes from several different directions. He carefully begins this book by discussing the Indian thin-fat phenotype. This phenotype, typical of Indians, results in the Indian people having a high amount of central adiposity (abdominal fat). A phenotype resulting from the environment of the womb (connected to the thrifty phenotype theory), this theory suggests that Indians are more susceptible to metabolic disorders. Diabetes and obesity are therefore developmental in origin. Giving us an account of his visit to Dr. Yajnik’s clinic (Dr. Yajnik is one of the two authors who proposed the theory of the thin-fat Indian phenotype), he reports Yajnik’s opinion that there is a need to address the underlying susceptibility of Indian bodies to being afflicted by metabolic disorders, rather than focusing purely on the treatment and prevention of the diseases themselves. Talking to householders and the other people that he encountered throughout his fieldwork, Solomon plots the changing perspectives in relation to food and the body. He considers the conception of both the food and the body from the viewpoint of doctors, epidemiologists, scientists, nutritionists, housewives, street food servers, and manufacturers of processed food products. Tracing the historical perception of the problem of diabetes in India, Solomon brings forth the idea of “tenshun”. “Tenshun”, that mental stress which his interlocutors claim, afflicts the mind and predisposes people to obesity and diabetes, is at the heart of the epidemic that plagues contemporary Indians. Hinting at the ever-shifting discussions about bodies, he brings to light the many terms that people use to refer to overweight and obese bodies. This is important because people in India are showing signs of obesity. The words used range from mota (Hindi for fat) to the usage of the English word “healthy” to allude to overweight or chubby bodies. Diseases too are referred to with specific names. Diabetes could be referred to simply as sugar and cardiovascular disease as blockage. Solomon’s aim in discussing these terms is to imply that metabolic disorders have become common enough to form a part of the daily conversations of Mumbaikars. The threat of being afflicted with diabetes or obesity is real and looms large in their minds. This brings us back to the idea of “tenshun”. Through the course of this book, Solomon brings to light his interlocutors’ claims that merely living in Mumbai makes one’s body absorb the stresses of living, in turn creating diseased bodies that suffer from metabolic problems. Every discussion about obesity and diabetes gave way to deliberations pertaining to stress. His participants assert that the stresses of city living affected their diets, the development of their illness, and their body’s responses to such health conditions. Solomon weaves the chapters of his book together using interludes. These interludes, tangentially connected to the general theme of illness absorption that is so central to this book, are heavily fleshed out ethnographic vignettes about the city of Mumbai. These detailed descriptions talk about the mango madness that endangers the carefully prescribed diets given by exasperated nutritionists. They tell us of the struggles of Manuli (Manuli is that suburb of Mumbai where Solomon carried out household research) locals in attempting to have the governmental authorities take note of their troubles over accessing their share of food owed to them through the state’s ration card. These vignettes transpose the reader to the site of the study. They render Mumbai as a city of multiple communities and provides the reader with a multi-faceted understanding of Solomon’s field site. The strength of this ethnographic work lies in its multi-pronged approach. Not only does he interact with housewives, so well known as the domestic gatekeepers of Indian households, he also studies and interviews food corporation researchers and marketing heads, whose aim is to float “functional foods” that these very housewives will allow into their homes. By considering the struggle between the concerns about adulteration (milawat) which his respondents focus on intensely, the author discusses the newest fad of “functional foods” which are becoming popular in Indian households. Functional foods are foods created by food companies to render everyday staples healthier. Functional foods promise “extra benefits” because they are enriched with vitamins and minerals. They espouse to function categorically by aiding in the prevention of metabolic disorders. Fast gaining popularity in India, functional foods claim to assure buyers that they will alleviate their health problems. In such a manner, everyday staples such as wheat, rice, flour, and milk become functional foods. In the face of fears about adulteration and metabolic problems, the author demonstrates why and how functional foods are gaining traction in India. Solomon pushes the envelope on the famous concept of ‘gastropolitics’ put forth by Appadurai and studied by many food scholars since. Using the example of the famous Mumbai vada-paav, he connects street food to the very identity of urban spaces. Focusing on the vada-paav, referred to as the “lifeline of Mumbai” by some of his interlocutors, he pushes forward the concept of gastropolitics to demonstrate to the reader that street food can be reflective of politics, power, and class dynamics within a city. Attempting to trace the origin of the vada-paav, its usage, and its attempted standardization by both political parties and food corporations, the author states, “By moving beyond the confines of street food as a bounded entity, it is possible to map the reaches of gastropolitics into livelihoods, community injuries, dreams of urban renewal, and transnational enterprise” (Pg. 75). In the latter half of the book, Solomon focuses on the clinical therapies and gastric bypass surgeries taking place in Indian hospitals as the site to study the discussions pertaining to metabolism. While early on in the book he deliberates on the ever-blurry food-drug boundary, in the latter half of the book he acknowledges the necessity of looking at diets as therapy. Shadowing clinical dietary therapists and nutritionists, he demonstrates the daily struggles of both the clinicians and the afflicted when it comes to nutritional therapy. In a clinician’s office where metabolism is being treated as a site of problem, multiple medical epistemologies collide. As Harris states, “These counseling visits illustrate the power of diets to coordinate the uncertainties of the metabolism” (Pg. 160). In these clinics, the onus is not only on the patient’s metabolism but also on their compliance. Dieticians insisted that patients’ compliance or non-compliance was what affected the result of dietary therapy. The dietician’s office was also a place where functional foods were prescribed to ailing patients. Such clinical therapies involved first measuring the patients’ bodies, both outwardly and internally. Weighing and measuring bodies went hand in hand with blood sugar, cholesterol, and hormonal level test. Through his ethnographic vignettes, Solomon manifests that the Ayurvedic concept of food as medicine is significantly overlapping with biomedical treatments for metabolic disorders. The result is a medical landscape that is vastly varied but one where food takes the center stage when it comes to health and disease. Solomon concludes the book by considering the idea that “as metabolic illness increasingly occupies global health interest and investment, what is needed is a perspective on metabolisms and their disorders different from one grounded in concerns about overconsumption” (Pg. 228). By tracing the historical food flows, the current shifting foodscape of Mumbai, the food standardization attempted by corporations, the author demonstrates to the readers that metabolic diseases are firmly entangled in social, political, gendered, and historical processes. Harris claims that through his work he approaches the concept of metabolism ethnographically. He states, “My principal concern in this book has been to develop an ethos of absorption at the interfaces between food and living” (Pg. 227). A wonderfully evocative ethnography, Solomon’s book makes one reflect on the very nature of metabolic syndrome. How does one address the solutions to a health problem that is so closely connected to food? The very food and eating which are sacred, political, social, and emotional. Metabolic syndrome renders food as a focal point. Food can be addictive, rendering one’s body diseased, or it can be therapeutic, cleansing one’s body from the inside. Through this book, Solomon relays and reflects on this problematic relation, challenging medical experts to consider a multi-layered approach to solving the issues of obesity and diabetes that plague contemporary India. March 17–St. Patrick’s Day fell on a Friday during Lent, when Roman Catholics ordinarily forego meat. But this year the Boston-based Roman Catholic Cardinal O’Malley gave everyone permission to eat meat–i.e., corned beef–so they could celebrate their heritage. The unconsummated union of Unilever and Kraft-Heinz continues to generate commentary. Jack Nelson, in the Financial Times, praised Unilever’s “responsible capitalism” as contrasted with Kraft Heinz’s “red blooded cost cutters” who cut jobs and divisions with abandon, with no concern for affected workers and places. Will Hutton argues that “companies with a declared purpose perform better” (a reference to responsible capitalism as opposed to unbridled profits). Share holders, according to various sources, are of mixed opinions. Depends who you read and trust. Avian flu has struck Tennessee farms that supply Tyson Foods. All birds within a 6 mile radius of the observed outbreak have been culled. Stay tuned. This is not the end of the story. Ask: besides the birds, who suffers the losses? You can track these and other avian flu pandemics here. Score spuds for “The Martian.” The International Potato Center (CIP) one of the consortium of international agricultural research centers, this one based in Lima, Peru, has imitated “The Martian” (i.e., the movie’s) potato experiment on desolate Mars — this time for real in the Peruvian desert. The experiment reports promising results! The CIP experiment can also be looked at the opposite way: using Peruvian conditions to shape understandings of what might be grown on Mars under what modified conditions. The Philippines, annoyed at the highest levels with US policy, has struck a trade deal to send agricultural (among other) products to China. Officially warming to the Chinese as a partner, the government is also scorning the US. In keeping with new US administration policy on “America First” high level US officials push to raise US scrutiny of China food deals in the US (e.g., Chinese investments that result in takeover of US food companies). What do I think? Company lobbyists are always trying to influence regulations and findings. Results of experiments designed to judge carcinogenicity, and impacts on ordinary people who use Roundup, depend on terms of exposure to the chemical and individual vulnerability. As a result, different studies reach different conclusions with opposite safety-policy implications. Why are these issues surfacing now? Glyphosate’s safety evaluation is up for renewal in the US and Europe (and the world). On another topic, leading chocolate companies have pledged to advance platforms and guidelines for sustainability; more precisely, to prevent deforestation. Some of these companies in the past have posted confusing standards. Note that the efforts are addressed at high levels (states, corporations) and while they voice concerns about small farmers, don’t formally integrate them into the proposed decision making for new normative practices. Cargill, Kima. 2015. The Psychology of Overeating. Food and the Culture of Consumerism. London/New York: Bloomsbury Academic (216 pp). The book’s main protagonist is Cargill’s patient, Allison, who is obese and unhappy. Allison feels isolated and wants to lose weight in order to improve her social/dating life but is caught in an endless loop of seeking out new products to facilitate her efforts. From expensive juicers and nutritional supplements, to super foods and gym memberships, Allison’s attempts at weight loss are mitigated by her purchases and are short lived; they are interspersed with binge eating episodes and breakdowns. Cargill’s efforts to convince Allison of the futility of her approach are ineffective, in part giving rise to Cargill’s desire to write the book. The book consists of eleven short chapters, beginning with an introduction in which we come to know Allison and learn of the main problem Cargill hopes to tackle in the book: the powerful forces of consumerism that lead most of us to overeat. She then turns her attention to a general discussion of consumerism: it’s rise in the U.S. (Chapter 2) and the psychological distress it causes (Chapter 3) before tackling consumerism and food (Chapter 4) and the way the food industry is tricking/manipulating its consumers into eating more (Chapter 5). For Cargill, the culprit of our malaise is sugar, the overconsumption of which she links to its historical rise as a commodity (Chapter 6) and our biological propensity to enjoy it, a fact that the food industry preys upon to create ‘hyperpalatable’ and addictive foods (Chapter 7). 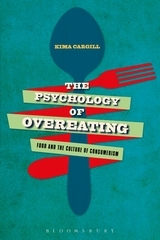 These first seven chapters set the stage for the most interesting (and most anthropological) part of the book, in which Cargill gives an account of the newly designated psychological disorders of Binge-Eating and Hoarding (Chapter 8). In support of her main thesis, both ‘overconsumption’ disorders emerged at the same time, in 2013 with the publication of the updated Diagnostic and Statistical Manual 5 (DSM), the handbook of all disorders penned by the American Psychiatric Association. In her discussion of the manual, Cargill draws our attention to the way that treating Binge-Eating and Hoarding as psychological disorders blames the “bounded individual, decontextualized from surrounding cultural and economic forces” (114). She recognizes the power the DSM has in establishing psychological norms, which shapes the experience, diagnoses, and treatment of psychological disorders. But a Foucaultian she is not; after recognizing issues with taxonomy, she is quick to defend the ‘purity’ of the scientific method (128) and views the adulteration of it as stemming from the pursuit of profit. The fact that overeating is now considered a psychological disorder sets the stage for her discussion of how Big Food and Big Pharm are working together to create and then medicate consumer-driven problems (Chapter 9), which the FDA has little power to monitor or quell (Chapter 10). In an all too familiar tale, then, Cargill presents another case in which consumer culture aids corporations in seeking profit at the cost of consumer health. She concludes the book with some tips on how to consume less and more wisely, in order to regain control of our eating and consumption habits and reverse “the course of Empty Selfhood” (154). The strength of the book is no doubt the way that Cargill seeks to situate psychological disorders and the problem of overeating within the larger cultural context of consumption, a necessary step to understanding the dilemmas individuals face in our society. But in some ways the book fails to deliver on its promise, mostly due to a lack of theoretical framework (e.g. practice) through which to integrate psychology, biological and ‘unconscious’ drives, positionality, the pressures of consumer life, and the marketing tricks and ploys used to sell products. As such, the chapters move between historical accounts, personal anecdotes, popular culture, philosophy, evolutionary psychology, social theory, personal opinions, and Allison’s (and other quickly introduced and then forgotten patients and acquaintances’) perils. This ad hoc approach undermines analytical cohesion as anecdotes work against and often contradict previously established arguments. For example, in addition to education and policy change, one remedy Cargill suggests for fighting the forces of consumerism is for individuals to use their ‘common sense.’ She writes: “With the notable exception of children, no matter how little education someone has, no matter how little nutritional literacy one has, there is still common sense. None of us is forced to eat junk food and it doesn’t take a college degree or even a high school diploma to know that an apple is healthier than a donut” (59). Setting aside the way she ignores how common sense is itself a product of power relations, Cargill’s book is full of examples where she is the only one with such ‘common sense.’ Indeed, we are presented example upon example where Cargill is ‘surprised’ and ‘puzzled’ by her (educated!) friends, students, and patients, and their lack of knowledge about simple nutrition. According to Cargill, this is due mostly to the way our psychological defenses allow us to “conveniently deny” (73) food’s unhealthy properties. Although she seeks to integrate psychology with cultural context, Cargill inevitably returns to the individual to account for why we overconsume. This is most apparent in her conclusion, where she offers advice on how to consume less and more wisely. But by focusing on consumption practices, in an odd way Cargill aligns with the very system she seeks to critique: agency comes through what we choose to buy (or not buy) rather than our activity in social and political life. As a whole, this book is best suited for those struggling to control their desire to overeat and looking for inspiration to cut back on consumption. Some should consider supplementation to better control their appetite check the user review when in doubt about a product and do your research! In an academic setting, Chapter 8 would make a nice addition to an undergraduate course on Medical Anthropology; Chapters 7, 9, and 10 could be useful on a syllabus for an undergraduate course on food and health.